Welcome to the online press kit for Becka and The Big Bubble! Kids love Becka! Kids love Bubbles! Education & Adventure... and Bubbles!!! How can parents and teachers educate, inspire, and help children build the confidence to try new things? 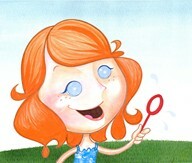 Becka and the Big Bubble books re-open this exciting world for our children. With imaginative illustrations and playful rhymes, Becka takes 2 to 8-year-olds on intriguing adventures, seeking out exotic cultures and new vistas. Sometimes Becka brings her friend, Ben, and she always returns home safely by book's end. From Mother Goose to Dr. Seuss, we've seen the impact of rhymes on learning and retention. And, what vehicle could be more enticing to a child than a bubble? 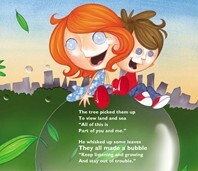 Becka and the Big Bubble books have all of the delightful ingredients needed to inspire our children's imagination. Brother and sister team, Gretchen Schomer Wendel and Adam Schomer, have created this series from their love of travel and their love of children. Becka and The Big Bubble: All Around Town, Becka and The Big Bubble: Becka goes to the North Pole, and Becka and The Big Bubble: Becka goes to San Francisco are now available. New adventures are coming soon! Copyright 2019 Becka and the Big Bubble. All rights reserved. - View Mobile Version of this Press Kit.